Overmountain Victory Trail Association - "The Dates"
Below is a compilation of major events that occured on the days leading up to the Battle at Kings Mountain where the Overmountain Men of 1780 won a decisive battle that preserved America’s independence from England. British Commander Sir Henry Clinton and Lord Cornwalis, dispatched to America by King George III, plots a strategy to defeat the Continental Army and force the colonists to swear allegiance to the British crown. With forces in place to the north, the plan was for Lord Cornwalis to take control of the southern ports including Wilmington, Savannah, Beaufort, and ultimately Charles Town - present day Charleston, SC. This "Southern Strategy" would seize control of the south and allow British forces to advance north and defeat George Washington's Continental Army. By all accounts, the plan was working. Decisive inland victories occur at Camden, Waxhaw, and Charlottetown (present day Charlotte). Men throughout the colonies reaffirm their allegiance to England, many in fact joining forces with the British to deliver a devasting military defeat to America's cry for independence. The possibility of a free America is in peril. But as you will read below, the brave actions of a group of neighbors who gather their own horses, weapons, and provisions, band together....slog 330 miles through snow, sleet, and torrential rains, engage and defeat the world's most feared and well provisioned army changing the course of history, forever. HUZZA! Ferguson’s Loyalist army at Cane Creek, a few miles south of Morganton, NC, and then retreat over the Appalachian Mountains to Sycamore Shoals near present day Elizabethton, TN. As a prisoner of war released by British Major Patrick Ferguson, Patriot militiaman Samuel Phillips delivers Ferguson’s threatening message to Isaac Shelby in the overmountain regions of NC. Isaac Shelby rides 40 miles to the home of John Sevier to talk about the threat. The men agree to send messengers to call for a muster of militia at Sycamore Shoals, present day Elizabethton, TN. September 24 – Virginia's Colonel William Campbell leaves The Muster Grounds, present day Abingdon, VA, with 200 Virginia militiamen. William Campbell's brother, Colonel Arthur Campbell leads another group of 200. They ride along the Watauga Road. September 25 – Four-hundred eighty militiamen from the Overmountain regions of North Carolina (today’s Tennessee) muster at Sycamore Shoals with the militiamen from Virginia and one hundred sixty militiamen from Burke Co., NC. 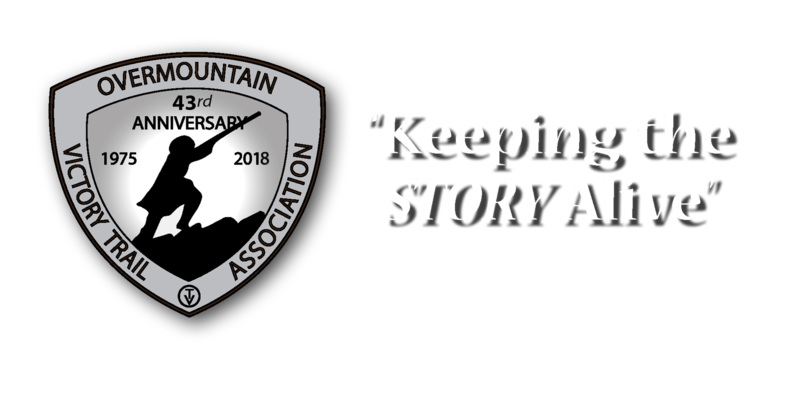 September 26 – The Overmountain Men ride toward the mountains driving a herd of cattle to feed their army; they camp at Shelving Rock, keeping their powder dry beneath the rock outcropping, safe from the pouring, cold rain. September 27 – The Overmountain Men “Cross the Roan” through the Yellow Mountain Gap after slaughtering beeves and preparing the meat. On the approach and over the mountain saddle, they parade in “snow shoe-mouth deep” and take roll. Two men with Tory leanings are discovered missing. The Overmountain Men camp along Roaring Creek. Meanwhile, in the northern Piedmont of North Carolina, 350 Wilkes-Surry Patriot militia under the command of North Carolina's Major Joseph Winston and Colonel Benjamin Cleaveland ride upstream along the Yadkin River toward Quaker Meadows. September 28 – The Overmountain Men move south along the North Toe River and camp where it joins Grassy Creek, near present day Spruce Pine, NC. September 29 – Patriots divide into two groups near Gillespie Gap and descend the Blue Ridge Mountains following separate routes; they camp at Turkey Cove and North Cove, north of present day Marion, NC. September 30 – The two groups of Overmountain Men ride along separate routes near the Catawba River. They camp at Quaker Meadows, north of present day Morganton, NC, where they are joined by the Wilkes-Surry militia and others. The spirit of the men is lifted as the band of Patriots grows in number. October 1 – The combined army of over 1400 militiamen head south toward Gilbert Town, near present day Rutherfordton, NC, where they expect to engage in battle with Ferguson’s army. Because of heavy rain, the Patriots stop in the late afternoon at Bedford Hill in South Mountain Gap near present day Dysartsville, NC. October 3 – The Patriot militiamen prepare for battle and move toward Gilbert Town along Cane Creek, along present day NC Hwy 64. They do not pitch camp; the men sleep on their arms. October 4 – The Patriots arrive in Gilbert Town to find that Ferguson is already gone. The militia leaders send out scouts and continue south to learn if Ferguson is heading for the fort at Ninety-Six (SC) or for Charlotte (NC). October 5 – The Patriots head southwest and camp at Alexander’s Ford on the Green River. They learn from scouts that Ferguson is marching toward Charlotte and the protection of Cornwallis’s army. October 6 – The Patriots ride southeast toward Cowpens and join with militiamen from South Carolina, Georgia and Lincoln Co., NC. They learn that Ferguson is only 35 miles away, encamped at Kings Mountain. The leaders pick the 900 best marksmen and the 900 fastest horses. At 9:00 P.M. these Patriot militiamen ride into the night as a pouring cold rain continues to fall. Mountain at 3:00 pm and in “one heroic hour” captures or kills - including the despised Patrick Ferguson - the entire Loyalist Army. The Patriot losses are small: 28 killed and 62 wounded. The Loyalists suffer more: 150 killed, 150 wounded, some 800 captured. Cornwallis’s left flank is destroyed. Epilogue – With this Patriot victory at Kings Mountain, the British found it harder to muster Loyalists. After subsequent battles at Cowpens and Guilford Courthouse, Cornwallis decided he could not subdue North Carolina. Cornwalis moves into Virginia; just 12 months and 12 days after the Battle of Kings Mountain, surrendering the British forces to the Continental Army under General George Washington, on Oct. 19, 1781 at Yorktown, VA.